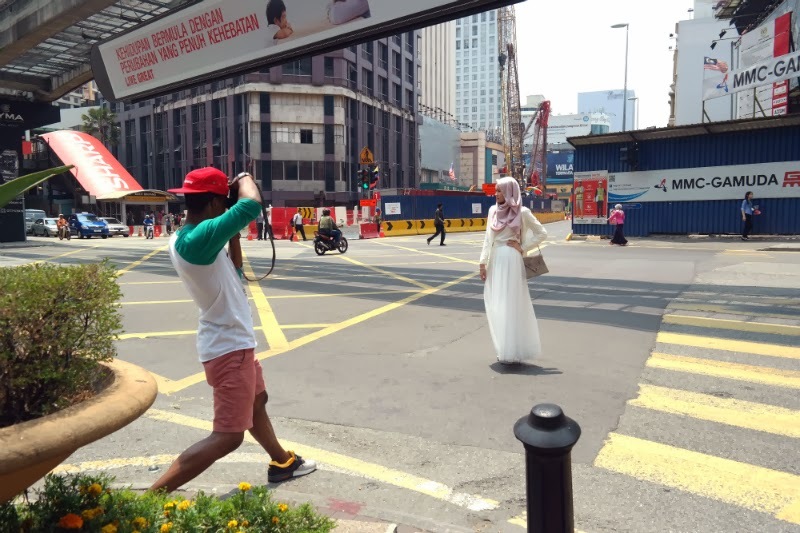 Two days after Langston Hues : Meet & Greet at Talent Lounge , I had the chance to participate in Langston Hues' photoshoot at Bukit Bintang area Kuala Lumpur. Who is he? If you don't know already, he is an international photographer from Detroit USA who has been on a world tour for his project and documentary, Modest Street Fashion, where he documents people's looks from all over the world for his book. His book will be like a lookbook of different fashionistas all over the world expressing and projecting what they define as modest clothing. When I was called up to participate in the photoshoot for the book the week before I told them that I'll be coming with 2 of my bestfriends. I invited Shima Adrina Rosmi, Hasanah Hilmi and my sister in law Syahira Zakaria because I saw on Langston's IG that those interested to be photographed can actually email him to set up a date so I thought, why not just bring people I know would be really interested and are to me fashionable and stylish in their own way? How did I feel? Nervous of course. They all wanted me to go first. I may have looked calm and collected according to the girls but only God knew how nervous I felt inside. After the camera shoot, Langston took a short video for me to introduce myself. "Hi my name is Raja Nadia Sabrina from Kuala Lumpur shooting with Langston Hues for Modest Street Fashion and it has been really amazing!" "What does Modest Street Fashion mean to you?" I must admit I was caught off guard by the whole interview thing and did not have any time to think... I answered something along the lines of "Modesty in itself is so subjective and to me Modest Street Fashion is when you bring out your own individuality through fashion..." err something like that..
Gosh, I wish I had the chance to record it all over again because I was just so nervous!! Haha..
Anyways, from the pictures from my camera in this post you might notice that the tone is a little bit over-exposed as I had some problems with my camera settings. But I had a peek at Langston's camera and the shots he took undoubtedly turned out so great. He is one really talented dude! Oh and a bonus for me, Langston helped me set my camera back to normal after the individual shots! Yay! After I was done Shima snapped her modest look with her fedora, cardigan and palazzo pants. Then Syahira was up next. She wore a long vest, with a yellow top, camouflage skirt and a gold belt. She did a behind the scenes post too. Do check it out! To everyone's surprise including herself, Hasanah, someone who does not like to be photographed alone, completed her shoot in less than 1 minute. Like a pro! And I am not exaggerating! That was how good Langston is! She didn't think she was ready but Langston got the shot! Inspiring. He is really good at making you feel comfortable and capturing shots. Langston told me that the secret is to limit yourself to 10 frames for each look. That's a reaallly good advice that I should heed for future outfit shots! Haha. Coz it's always a hassle to choose from a million photos! Captured this candid picture while they were happy that the individual looks photoshoot was done! 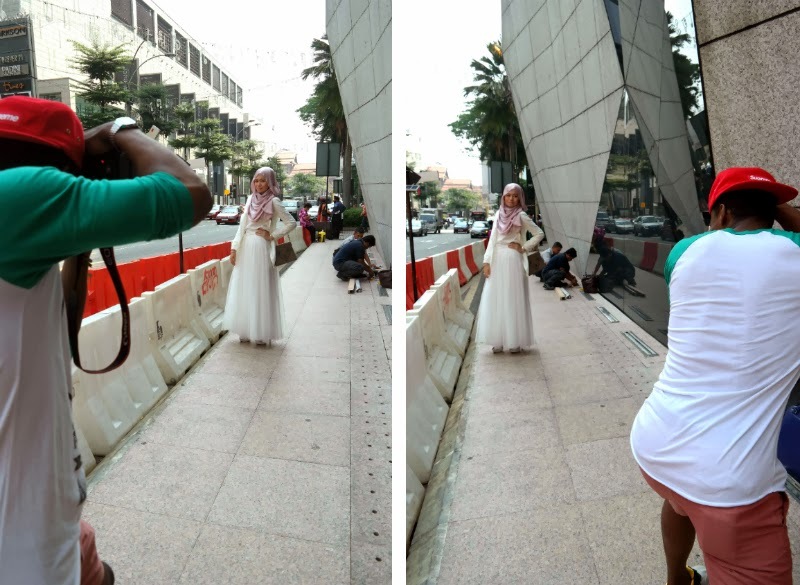 We first took photos from the other side of Bukit Bintang near JWW Marriott. Then we went on to Lot 10 for some more shots. The shoot turned to be more interesting when Langston decided to shoot Indah Nada Puspita in the middle of the road! Nada is a 20 year-old Indonesian fashion blogger who's studying biology in Germany and she came all the way to Kuala Lumpur from Germany after a one-day stop at Indonesia. She came straight from the airport for the shoot with her luggage bag and all. Travelling from across the world for the photoshoot! I guess that itself tells you how awesome Langston is! While Langston was snapping shots of Nada in the middle of the road, the Bella TV crew started shooting Syahira and I while we were standing and talking to each other. I do not have any photos of that but I managed to capture some pictures when they shot Shima, Hasanah and the kind and lovely Iman Salam who organised the shoot and scheduled us in for the photoshoot. Bella TV came to interview Langston on his project. After shooting Nada in the middle of the road, Langston decided to shoot one other girl in a back alley and all of a sudden I was shot again too! At the end of the interview, Bella NT7 wanted to capture Langston shooting me so Langston told me to stand in the middle of the road when the traffic light was red. He got a few shots and to our surprise cars started coming from another direction we both did not expect and I slipped beside the road! These photos were taken moments before I slipped. After a long day under the hot sun, we all went for late lunch at Madam Kwan's. We had our tummies filled with some good food and had a good time getting to know each other better. Oh, and we met the Madam herself too after we were done with lunch! Then after lunch, probably inspired by Langston, my friends and I went and did some look shots outside for a little bit. (I'm going to blog about that too in the near future, God-willing). 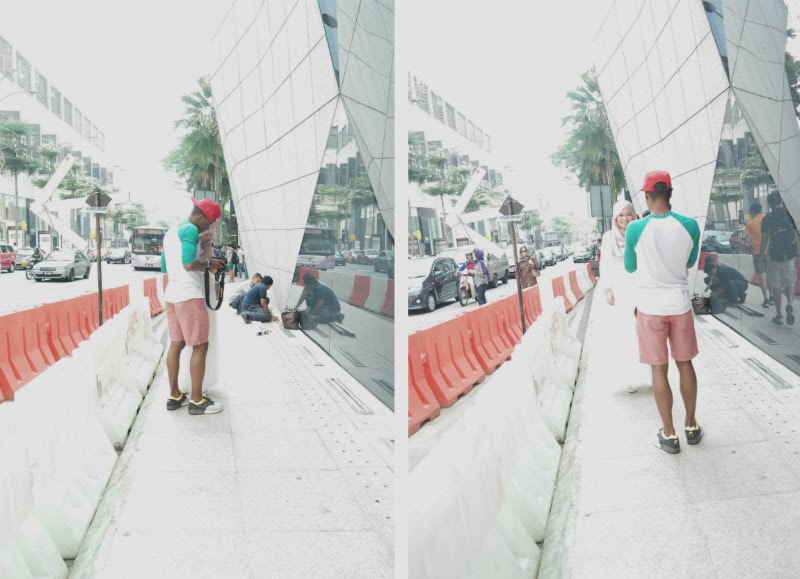 As we were heading back to Pavilion to call it a day, we bumped into Langston and crew again and this time around he was with Wak Doyok. All of us then took turns taking photos with the male fashion icon of Kuala Lumpur. All in all, it was a really exciting day. I hope Langston continues to promote the movement and finishes his project. I would love to see his finished book and find modest fashion inspirations from around the world and compare how everyone in different parts of the world define modesty. Definitely can't wait for the book~! Support him and follow his updates by following his IG @langstonhues and his website : Modest Street Fashion. I end this super long post by sharing this photo where the Mr funny guy Langston photobombed Sya and Nada during lunch! !